Creating documents based on CRM data has never been easier. Based on MS Word-templates, the Server-side document generation provides you with a set of tools to create and process documents inside CRM. Open the wizard to view license options and find the best choice for your business! for CRM - Online customers a web-based setup is provided to keep the installation even mor simple. Click on the "Configure AutoMerge for your CRM environment" to get started! To install AutoMerge in OnPremise CRM environments a msi-file is provided for download. Running the msi will import the solution into your CRM-system and provide you with the printing service. AutoMerge provides a server-side tool to create and process documents. Thus, NO CLIENT installation is required. A simple setup provides you with all the AM features in a few minutes. Automation is key in order to speed up business processes. With the ability to perform document-specific operations in workflows AutoMerge provides a powerfull tool to optimize your processes. Click to see a common Workflow-setup. With the ability to add document generation to dialogs, AutoMerge opens up to meet a broad range of business requirements. Click to see the dialog-setup. All common file formats supported. 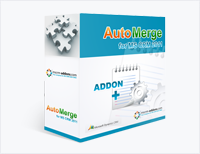 AutoMerge supports generation of pdf, docx, doc, html, jpg, bmp and png-files. Once the document is generated, AutoMerge can be set up to automatically stored files to Sharepoint (CRM-integrated SP or a StandAlone-SP). AutoMerge allows to save generated documents to CRM-records automatically. This e.g. enables you to attach pdfs to an email or store a report to a lead. With the service based printing, AutoMerge can be setup to use local and network printers to print documents inside your processes. For AuotMerge Online this capability is provided via Goolge-Cloud-Printing. All templates used by AutoMerge are based on MS Word. thus, you dont have to be an SSRS -expert with programming knowledge to get going. It's Easy to -do with no limitation on Word formatting. The DocumentsCorePack template designer provides a powerful tool to generate rich and complex documents based on CRM -data. Click to take a look on the broad range of features provided by DocumentsCorePack. One of the most common scenarios is "sending invoices or quotes as a pdf" to the customer. With AutoMerge this can be tracked down to be a 3- click- procedure! We all know: Having all reports stored assosicated to the correct CRM-record is hihgly important! AutoMerge provides a broad variety of options to specify save-locations. By the ability to create html-content out of the word document Automerge allows to generate complex emails including information from related entities (custom entities + custom fields) easily.